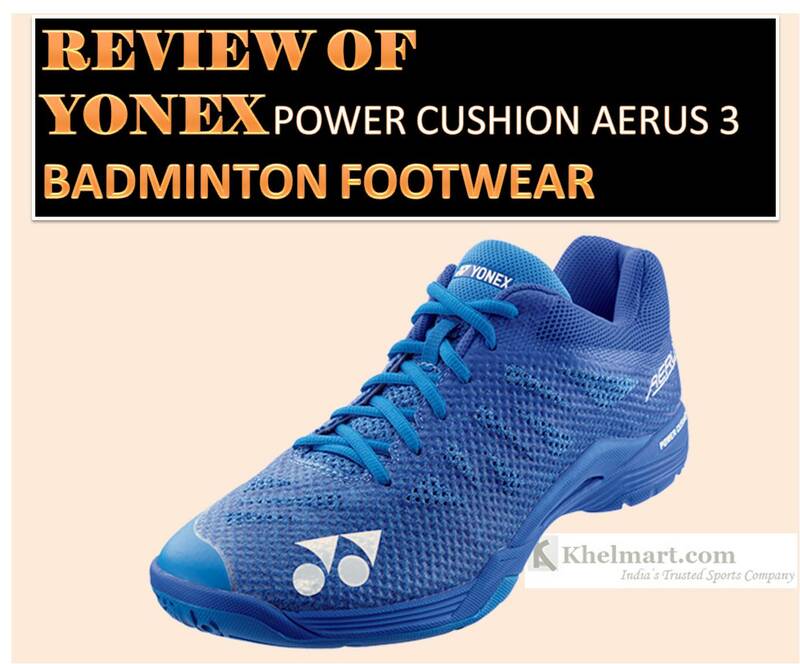 Review and details of Yonex Aerus 3 Badminton Shoes| khelmart Blogs | It's all about sports.. 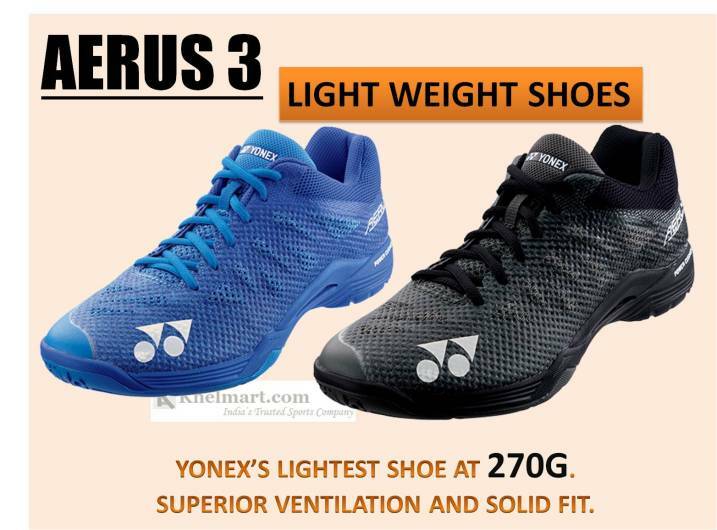 Finally Yonex introduces its flagship badminton footwear , Yonex Aerus 3 for pro players. Aerus 3 is launched in late Sept-18 with lots of new features, design and innovative concepts. 1. By understanding the need to modern game, Yonex decided to launch the latest shoe which is ultra lightweight in nature and flexible enough to offer natural foot movement. 2. Yonex worked on shoes weight and identified what are the key area where weight of the shoe can be reduce significantly. 3. To reduce the weight, Yonex used lighting material and latest manufacturing technique which is equipped with less stitching and more of high quality nylon meshes. With the use of lightweight material and better manufacturing technique, Yonex Aerus 3 weight is just 270 gms only. 4. Use on Nylon mesh also provides better flexibility and comfort to players. 5. This Yonex badminton shoes is developed with power cushion + technology which is next level cushioning and comfort feature in Aerus 3. 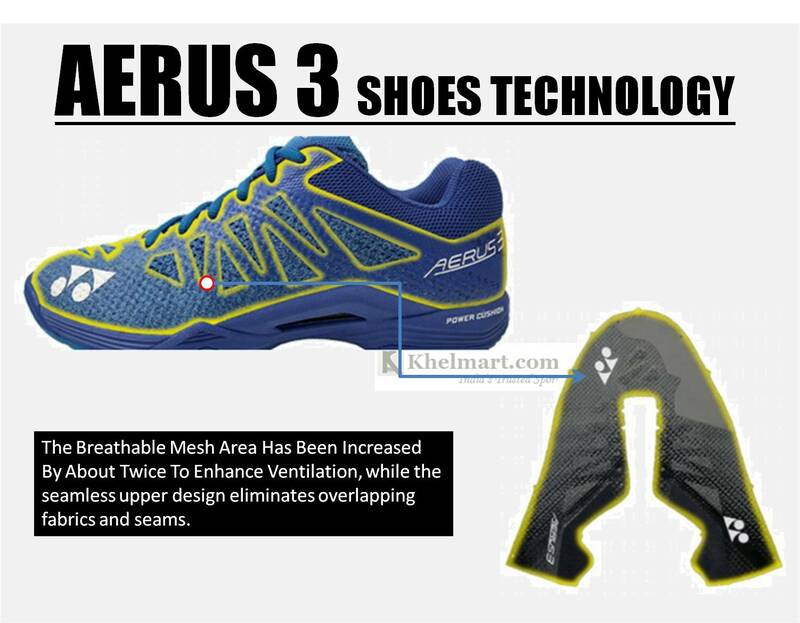 Like Aerus 2 , this shoe is also made with Yonex laminate and heat transfer technique. Nylon mesh used in Aerus 3 looks thicker as compare to Aerus 2 while lamination on top of the mesh looks stronger. We hope it will be durable enough. 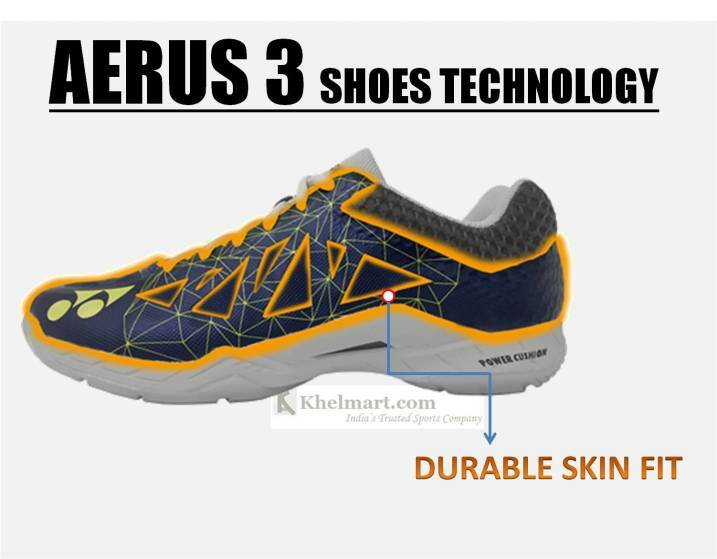 Aerus 3 comes in 2 color scheme for mens. Blue and Black color. For blue color, base is blue which is thick nylon mesh. While on top of it, light blue color lamination heat transfer is done. White logo on front side of the shoes looks very attractive. •	Ultra lightweight cushion technology ever. •	As testing results, Yonex fund that, power cushion + provides 25% better shock absorbing ability as compared to traditional power cushion. •	Further, Power cushion technology offers 12% better repulsion as compared to traditional cushion technology. Yonex used PU based durable skin lite with nylon mesh material which offers flexibility like rubber material plus it offers durability for long lasting game play. •	Better upper flexibility as compared to traditional PU based uppers. •	This technological feature offers improved fit between foot and shoe. •	It also maximizes the grip inside the shoe. •	It creates the secure contact between foot and shoe, which helps in proper energy management within the shoe. In this technology, shape of the inner and outer in sole in optimized as per foot shape to offers best contact between shoe and foot. Twisting is an important phenomenon in Badminton shoes. For Sharpe movement, twisting is important but it should be in control way. Uncontrolled twisting can cause serious injuries to players. Yonex used 3D power carbon which helps in avoiding unwanted twisting movement and offers a safe and steady foot movement. Yonex used toe centric shoe design concept, in this type of shoe shape, excess pressure on toe is cut down by improving the design changes. This also helps in better heel support and overall shoe comfort. Yonex used ultra light graphite material plate at the mid sole of the shoe. This light weight material plate helps in better stability and reduces the overall badminton shoe. 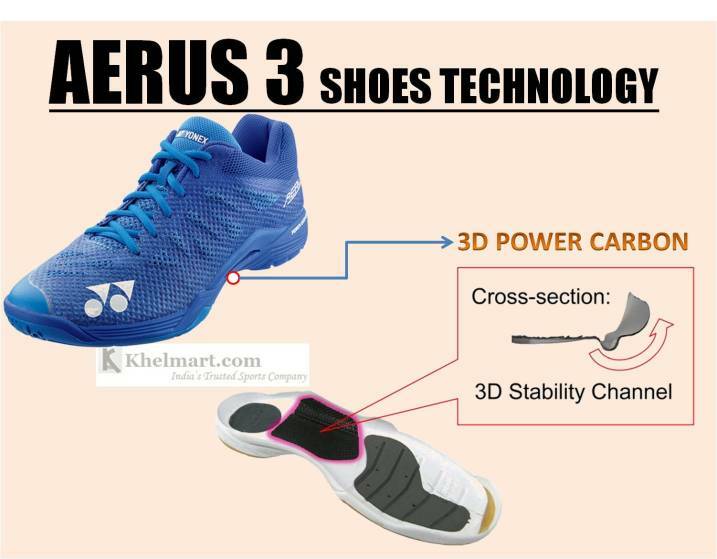 Yonex Aerus 3 is ultra light weight badminton shoe for professional players. 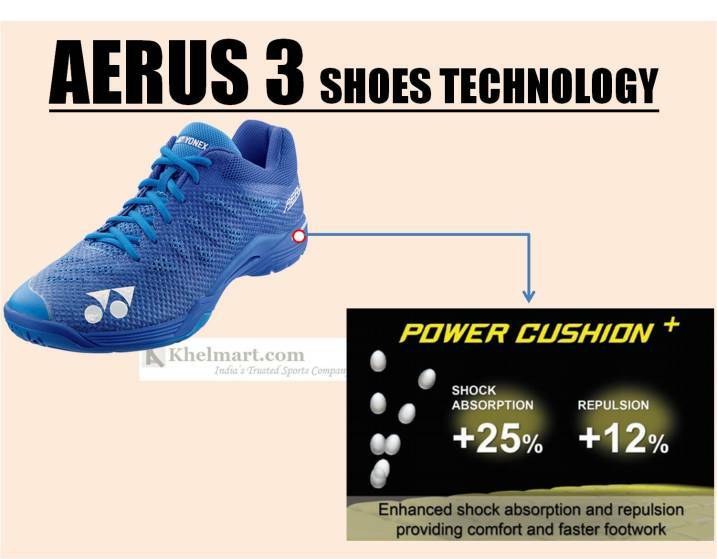 This shoe is equipped with latest shoe technologies especially with Power Cushion Plus technology which offers 25% better shock absorbing ability and 12 % better response. These shoes will be suitable for those badminton players who already tried Yonex power cushion shoes and wants to further improves the performance.